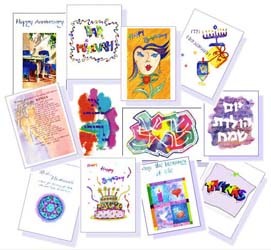 Unique artistic cards for every Jewish life event, from birth to Bar Mitzvah and Bat Mitzvah to bereavement and all events in between. 5 or more single cards! Cards are 5x7 inches, unless otherwise noted. Each comes with a brightly colored matching envelope. Sympathy and condolence cards come with high quality white or off-white envelope. We strive for minimum waste and maximize use of sustainable materials. Uncoated card stock is 30% recycled content from a supplier that uses 100% windpower to offset energy use. Coated card stock used for photo cards use are SFI (Sustainable Forestry Initiative) certified. For in-house printing, we use Xerox Solid Ink printers resulting in less waste when compared to typical laser printers. Check out our friends at JewishPeople.com!